Howdy partna! You're looking mighty fine in those cowpoke duds! Seems like you're almost ready to take on the Wild West! Just look atchya, ya got a leather vest and jeans, boots with the spurs, you're just about ready to saddle up and ride off into the sunset! 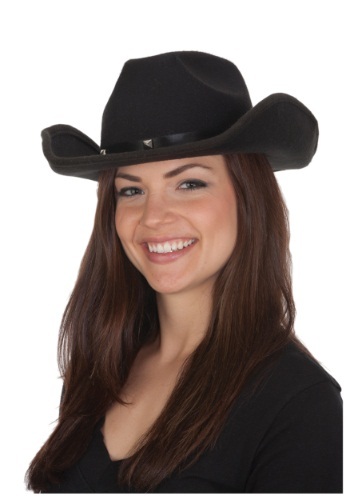 Although you are missing one thing and that just happens to be this Black Cowboy Hat! You can't expect to be taken seriously as a cowpoke without the proper hat. Once you throw on this Cowboy Hat your Old West transformation will be complete! You'll be ready to hog tie some wild boar, wrangle up wondering cattle, and finish every day at your favorite saloon for some well-deserved whiskey! Although don't go too crazy on with the whiskey, you can bet that some outlaws are going to notice that pristine hat sitting upon your head. Chances are you'll get wrapped up in a duel or two. So make sure that you perfect your quick-draw and have a respectable pair of pistols holstered by your side. Besides the occasional quarrel over your hat from time to time, you'll surely enjoy the rest of the night dressed up as a western hero!